Encryptomatic LLC today announced the availability of MessageExport 2.3. 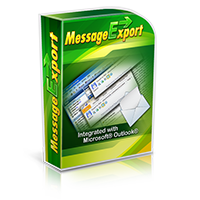 MessageExport is an add-in software that extends Microsoft Outlook's email exporting abilities. MessageExport is the premier tool for converting Outlook email messages to formats that include .pdf, .eml, .mht, .tif, text, and many others. MessageExport 2.3 adds compatibility for Windows 8.1. It includes a new file naming function that allows for indicating the presence of file attachments in the file name. When opening a .pdf file with embedded file attachments, the attachments panel will now open automatically in Adobe Reader. To download a 15 day free trial of MessageExport, and to learn more about it's advanced Outlook email exporting functions, please visit the MessageExport home page.